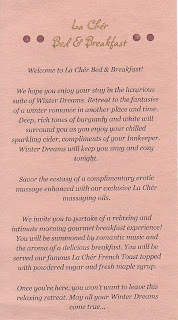 Whenever my husband and I get into a rut, he'll say that it's time to book a night at the La Cher Bed & Breakfast. I "opened" that B&B when we were newlyweds and both "starving students" in college... Well, we're no longer newlyweds and he is now the only one STILL in college (okay, he has progressed...it's Dental school this time), but even still, we keep going back to the La Cher Bed & Breakfast. This is an idea that really has to be personalized by you, but I'll start you out. Each time I do this, I come up with a theme for the room. 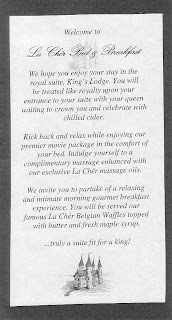 (I got ideas from browsing websites of real b&bs). You may have noticed already that I'm a checklist kind of girl. The rest is up to you...may your mind wander with creativity! And please, I live for your comments/ideas... So, take the idea, put your spin on it, and check back in and let me know how it went!